Impromptu late dinner-snack and we ended up at Miss Saigon. Because on that block of Kingsway on a Tuesday, it was the only game in town for eats. Anyway, even without Miss Saigon's grand opening special discount, portion for price is good (always worth bonus points). It's a bright, clean, place with friendly service. 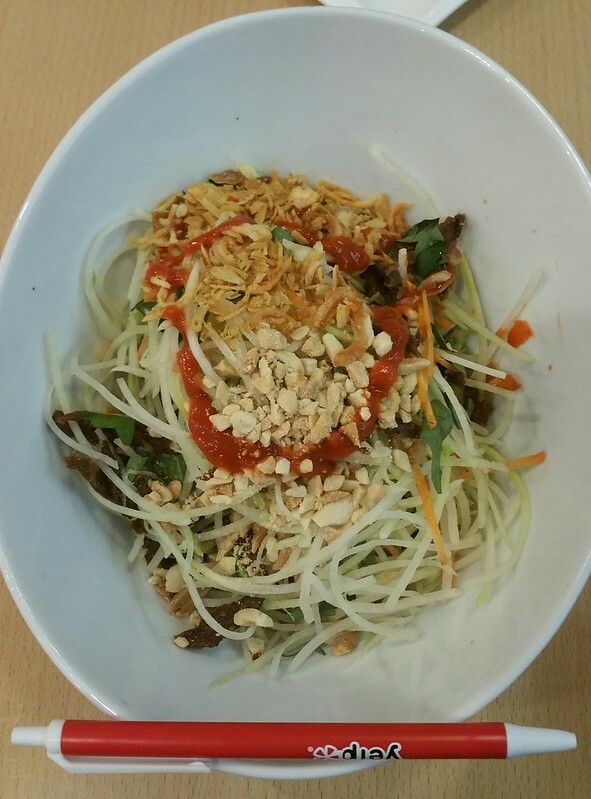 The mysterious "herbs" look like caramelized spring onion, cilantro, and peanuts. Overall sort of almost bland tasting except for the brilliant use of beef jerky, which was tasty and sweet. They oughta make a bánh mì out of that jerky. Use the provided sweet soy sauce, but not too much. Maybe 1-2 tablespoons max.